Deepen your sense of the past at sights like Calleja de las Flores and Mezquita de Los Andaluces. Palacio de Viana and Archaeological Ensemble of Madinat Al-Zahra will appeal to museum buffs. Next up on the itinerary: pause for some serene contemplation at Capilla Mudejar de San Bartolome, take an in-depth tour of Calahorra Tower, don't miss a visit to Patios de Cordoba, and get a taste of the local shopping with Sala el Potro. To see maps, traveler tips, where to stay, and tourist information, read our Cordoba online itinerary creator. London, UK to Cordoba is an approximately 7-hour combination of train and flight. You can also take a train; or do a combination of car and ferry. You'll lose 1 hour traveling from London to Cordoba due to the time zone difference. While traveling from London, expect much hotter days and somewhat warmer nights in Cordoba, ranging from highs of 43°C to lows of 22°C. Finish your sightseeing early on the 7th (Fri) so you can travel to Carboneras. Carboneras is a municipality of Almería province, in the autonomous community of Andalusia, Spain. To see more things to do, maps, where to stay, and tourist information, read Carboneras trip itinerary planner. Getting from Cordoba to Carboneras by car takes about 4.5 hours. While traveling from Cordoba, expect little chillier days and about the same nights in Carboneras, ranging from highs of 34°C to lows of 25°C. Cap off your sightseeing on the 8th (Sat) early enough to travel to Almeria. Almería is a city in Andalusia, Spain, situated in the southeast of Spain on the Mediterranean Sea. Kick off your visit on the 8th (Sat): steep yourself in history at Conjunto Monumental de La Alcazaba and then look for all kinds of wild species at Cabo de Gata - Nijar Natural Park. Here are some ideas for day two: find something for the whole family at Oasys MiniHollywood. To see where to stay, other places to visit, ratings, and other tourist information, use the Almeria trip itinerary planner. Getting from Carboneras to Almeria by car takes about an hour. In July, daytime highs in Almeria are 34°C, while nighttime lows are 25°C. Wrap up your sightseeing on the 10th (Mon) early enough to drive to Tarifa. As the southernmost point in Europe, Tarifa is famous for having the continent’s best windsurfing conditions, making it a well-known surfer’s paradise. On the 10th (Mon), kick back and relax at Playa Bolonia. On the 11th (Tue), you'll have a packed day of sightseeing: enjoy the sand and surf at Playa El Palmar and then kick back and relax at Playa de Zahara de los Atunes. To see reviews, ratings, photos, and tourist information, read Tarifa tour planner. Traveling by car from Almeria to Tarifa takes 4 hours. Alternatively, you can do a combination of flight, train, and bus; or take a bus. In July, daily temperatures in Tarifa can reach 32°C, while at night they dip to 24°C. Finish your sightseeing early on the 12th (Wed) so you can drive to Malaga. Modern yet historic, Málaga is a lively city famous for being the birthplace of Pablo Picasso. 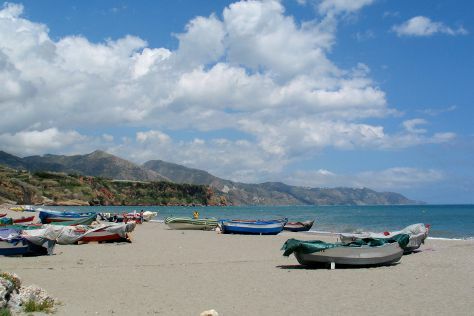 Step out of the city life by going to Playa La Carihuela and Playa de Burriana. 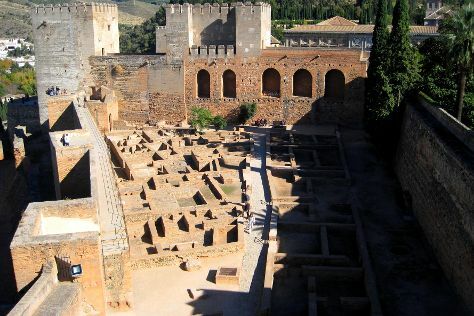 Visit Alcazaba and Castillo de Gibralfaro for their historical value. You'll find plenty of places to visit near Malaga: Playa de la Cala el Canuelo (in Nerja), El Torcal Natural Park (in Antequera) and Bioparc Fuengirola (in Fuengirola). There's still lots to do: look for all kinds of wild species at Butterfly Park of Benalmadena and see the interesting displays at Museo del Vidrio y Cristal de Malaga. To find other places to visit, where to stay, photos, and more tourist information, go to the Malaga vacation trip planner. Traveling by car from Tarifa to Malaga takes 2 hours. Alternatively, you can take a bus. While traveling from Tarifa, expect a bit warmer days and about the same nights in Malaga, ranging from highs of 36°C to lows of 24°C. Wrap up your sightseeing on the 16th (Sun) early enough to travel back home.